Peter J. Froese, minister and farmer, was born 17 January 1913 in Kondratyevka, Borissovo Colony, Russia to Anna (Penner) and Johann Jacob Froese. He was the sixth child in a family of five sons and six daughters. On 20 September 1940 he married Kornelia "Nellie" Ens (20 September 1919, Felsenbach, Borozenko, South Russia - 16 February 2016, Abbotsford, British Columbia), daughter of Isaac Ens (1880-1955) and Kornelia (Loewen) Ens (1886-1926). They had six sons and two daughters. Peter died 31 January 1997 in Abbotsford, BC. After grade six schooling in German and Russian, on 17 August 1926 Peter immigrated with his parents to Manitoba, Canada, settling on a farm at Willen, Manitoba. He attended Bible school in Winnipeg for a year in 1934-35. He was a keen student and when hard times made formal studies impossible he took correspondence Bible courses. He completed his theological training at Rosthern Junior College from 1938 to 1940. After his formal studies he continued to read widely. He was baptized by Elder Johann P. Klassen on 25 June 1934 at age 21. At this point he began to preach the occasional sermon, but it was after 1940 that he became more involved in his life's work of ministry while continuing to farm at McCreary, Manitoba. In 1946 the Froese family moved to a 20-acre farm in Abbotsford. 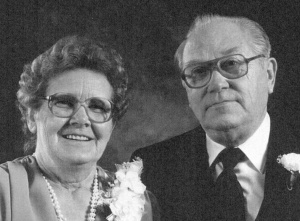 Here Peter and Kornelia joined the West Abbotsford Mennonite Church and Peter became active in the ministry, being ordained on 9 October 1949 by Elder H. M. Epp. He was elected as the leading minister and congregational chairman in 1958. Peter was an energetic supporter of the larger Mennonite organizations and was active in the BC Mennonite conference as secretary for three years and as a member on the Board of Christian Service and the Program Committee. He also served on the board of Canadian Mennonite Bible College, Mennonite Central Committee Canada, and on the provincial Inter-Mennonite Peace Committee for 18 years. At one point in his ministry, he served on nine committees and traveled widely to attend meetings. Peter loved to preach and to write. He preached regularly in German and English in West Abbotsford and was frequently called upon to speak or conduct evangelistic services in other congregations. His sermons appeared in Der Bote, and he wrote reports on conference activities and position papers on a variety of issues. At West Abbotsford he presided over the transition from a German worship service and Sunday school to a bilingual approach and was willing to accommodate that change. However, during this transition there was enough resistance to cause the formation of a daughter church, Eben-Ezer Mennonite Church, intent on maintaining the German language. He oversaw a time in which church levies were abolished, a step that was soon copied by neighboring churches. From 1967 to 1975 P. J. Froese became leading minister of Winkler Bergthaler Mennonite Church in Manitoba where he was ordained as elder on 17 November 1968 by Elder Jacob F. Pauls. There followed shorter terms of ministry with two years among the Umsiedler in Germany with MCC and two years as pastor of MacGregor Bergthaler Mennonite Church before retiring to Abbotsford in 1981. Here he continued to preach periodically in West Abbotsford Mennonite Church and in Clearbrook Mennonite Church, which Peter and Kornelia joined and where he preached until health failed him. Foth, Nellie and Peter Froese. "Eulogy for Rev. Peter J. Froese." Abbotsford: Unpublished. February 1997. Friesen, David. Journey of Faith: Winkler Bergthaler Mennonite Church 1895-1995. Winkler, MB: Winkler Bergthaler Mennonite Church, 1995. Loewen, David. Living Stones: A History of West Abbotsford Mennonite Church 1936-1986. Abbotsford, BC, West Abbotsford Mennonite Church, 1987. Archival materials in West Abbotsford Mennonite Church. Personal Papers held by Nellie Foth. Ens, Alvin G. "Froese, Peter J. (1913-1997)." Global Anabaptist Mennonite Encyclopedia Online. November 2001. Web. 23 Apr 2019. http://gameo.org/index.php?title=Froese,_Peter_J._(1913-1997)&oldid=154392. Ens, Alvin G. (November 2001). Froese, Peter J. (1913-1997). Global Anabaptist Mennonite Encyclopedia Online. Retrieved 23 April 2019, from http://gameo.org/index.php?title=Froese,_Peter_J._(1913-1997)&oldid=154392. This page was last modified on 19 September 2017, at 21:45.